Keisha has just returned home from a trip to Los Angeles. Since having met her back in grade four – during that fateful recess when we almost got into a fight over a plastic shovel in a sandbox – I’ve known Keisha to be a very determined individual. I should know – she made off with the shovel, after all. Throughout the course of our friendship, Keisha’s aspiring acting and singing career has taken great leaps and bounds. Just last year, she landed a role in both a feature length film and an episode of a popular TV series. Last week, she flew to L.A. to take part in a special acting class as well as live performance. I can also say, however, that over the course of our relationship, there is something else I’ve learned about Keisha. She’s not the most observant person in the world. Keisha, I guess you really are observant after all! What she was referring to, of course, was an advertisement for the wondrous procedure known as CoolSculpting. I’m glad she thought to tell me about this ad even though I have blogged about CoolSculpting a number of times before. Perhaps, if she was just a little bit more observant, she would have known that. Just teasing you, Keesh! To be honest, I’m happy to know that CoolSculpting is seemingly beginning to receive more of a mainstream push as it has been doing wonders for those who suffer from “stubborn fat”. 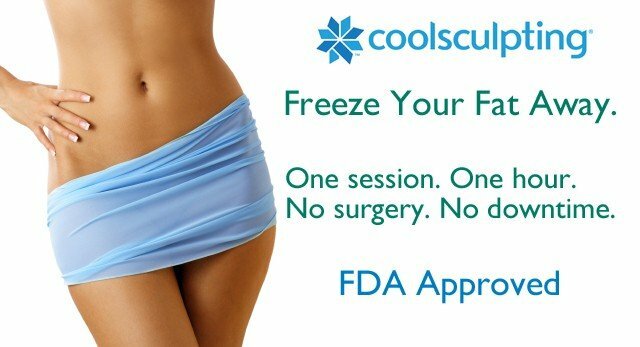 As I told Keisha earlier this week, the procedure uses an awesome cooling technique that freezes fat cells, allowing the body to naturally dispose of them. This helps to significantly reduce the appearance of love handles, muffin tops and bra bulges – you know, stubborn fat! What is so great about this procedure is that it is NOT surgery! It involves no cutting of any kind. It requires no needles or injections. It doesn’t even require an anesthetic. Instead, patients are fitted with a device that goes to work without the patient having to be put under. While fully awake, the CoolSculpting procedure takes place working on attacking those stubborn fat cells. As if that wasn’t “cool” enough, there is no downtime either. Since it’s not a surgery, there isn’t really anything to recover from! And while Keisha isn’t particularly in need of the procedure (we should all dream to look like she does), she now has a greater understanding that liposuction is not the choice way to go when wanting to rid yourself of excess fat. So similarly to myself, she too is now spreading the word about why CoolSculpting Attracting mainstream attention.